Racing Blue are pleased to announce their support of Bruce Talmage and Ian Seager as they take on Britain’s world famous marathon cycle ride from Land’s End to John O’Groats to raise funds for Macmillan Cancer Support. 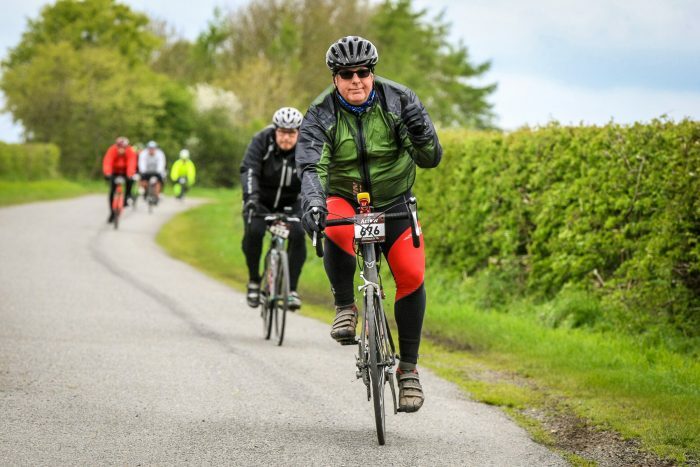 The Deloitte Ride Across Britain requires immense endurance as athletes cycle 108 miles every day, for 9 days. Passing through some incredible, breathtaking scenery and 23 counties, the ride starts on 8th September from Land’s End and finishes in John O’Groats on 16th September. Bruce, a 57 year old retired IT manager, took on this challenge for three main reasons – to support a friend, to raise money for charity and to give himself a personal challenge. Like many others, cancer has touched Bruce’s life with a number of family and friends diagnosed over the years and having experienced first-hand the brilliant support that Macmillan provide, he decided to raise funds for this wonderful charity. Holding a firm belief that it’s essential to challenge yourself on a regular basis and having previously sailed the Atlantic Ocean, Bruce decided the time was right to commit to his next big personal achievement and support a good friend in his journey both to the start line and to the finish line. In addition to providing sponsorship, Racing Blue are extremely pleased to be able to go one step further and assist Bruce and Ian in their training and race endurance, by supplying our latest product – STORM® Athlete. Specifically formulated to deliver a sustained release of beta-alanine – an amino acid critical to the efficient management of muscle acidosis that occurs during intense exercise. Our supplement helps to delay muscle fatigue by increasing the ability of muscle to buffer acidity (H+) such as from the accumulation of lactic acid in muscle. STORM® Athlete is suitable for any type of sport where quick acceleration or intense endurance is required, meaning Bruce and Ian will be able to sustain speed and power and cycle for longer! Training is well underway and over the next few months we’ll be keeping you up to date with all the latest on Bruce and Ian’s training and of course we’ll closely follow their progress during the ride itself! All of us here at Racing Blue would like to wish Bruce and Ian the absolute best of luck at every stage.